If you haven't yet heard, Elysian Brewing will start distributing to Montana next week, and to kick off their release they are hosting a week-long schedule of stops across the state. For a short history lesson on Elysian Brewing, the Seattle-based brewery has brewed over 200 different beers since opening its doors back in 1996, but it all started with the Wise ESB, followed by Dragonstooth Stout, the Immortal IPA, Zephyrus Pilsner, and Perseus Porter. The brewing company operates three Seattle brewpubs (Elysian Capitol Hill, Tangletown in the Greenlake area and Elysian Fields by Centurylink Field) and a production brewery in the Georgetown neighborhood. For the true history buffs out there, the Elysian plains, according to Greek mythology, were the final resting places for mortals either related to or chosen by the gods where they would remain after death to live a happy and blessed life [drinking beer?]. 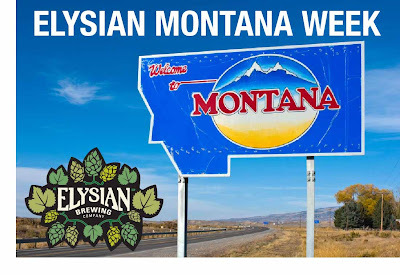 Join us as we travel across the state launching Elysian with Great Beer and Live Music at every stop! Music will be performed by our very own co-founder, David Buhler, from his new album - "What You Dream." Join us for live music from David Buhler and great beers on tap. Loser Pale Ale, Immortal IPA, and Mens Room Red will be available all night. See you at the Rhino for live music and beers. Mens Room Red, Immortal IPA, and Loser Pale Ale will be on tap. Come say hi to Matt Thompson, Dave Chappel, and David Buhler for happy hour. Enjoy some Elysian beers and live music from David Buhler after your work day. End the work week (almost) with a variety of Elysian beers on tap and live music from David Buhler. We are excited to be opening up Montana and we hope you and your friends can make it out to some of our events. *Photo courtesy Elysian Brewing's Facebook page.